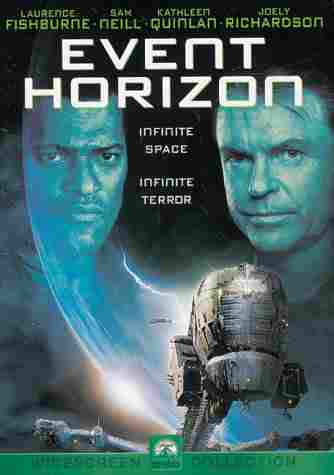 I hadn’t seen Event Horizon in I don’t know how many years. And it’s still a pretty good movie! Well, how could it not be good with Laurence Fishburne and Sam Neill as the stars. It starts off as mainly a Sci-fi flick, but as the movie develops it becomes more of a horror and there’s plenty of gore to go around. It was also trip down memory lane. Normal photo’s put up on a wall using prestik, no digital camera’s. It’s amazing how technology has advanced since Event Horizon was made. Do you remember watching it? What did you think of it when it first came out and what do you think about it now? Event Horizon was terrifying! When Sam Neill ripped out his own eyes (“Where we’re going, you don’t need eyes to see…”) I just about lost it. Great movie, though! Great movie! I loved this film, but I should watch it again now. I don’t like CGI..